Ocarina of Time’s Glitchless speedrun category seeks to complete the game as quick as possible without using game-breaking cheats and glitches, but a newly discovered trick is forcing runners to consider what is or isn’t a glitch to begin with. Is something a glitch if it lets you explore somewhere early? Or is it only a glitch if you’re breaking the game? The trick in question is called ‘Gate Skip’ and it was discovered by Ocarina of Time speedrunner and glitch hunter Rosewater. 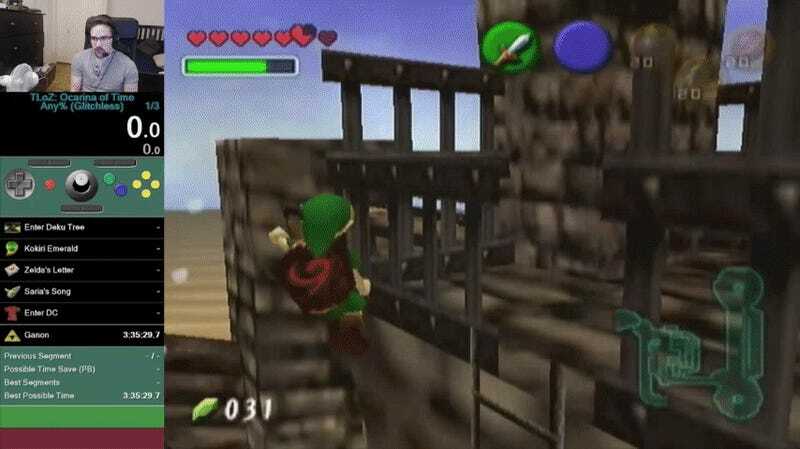 The technique allows runners to skip a very large gate in the Gerudo Fortress as Child Link. Normally, Link cannot be in this area as a child but it is possible to reach with other creative tricks. The Gate Skip involves using a bomb to launch Link off a high platform before slashing his sword to leap over a gate that leads towards the desert, where one of the game’s dungeons is located and saved around four to five minutes. When it was initially discovered, the trick was thought to be “TAS only,” achievable exclusively using special programming tools that allow players to control Link’s actions perfectly in an emulator. Daniel “dannyb21892” Baamonde, the current world record holder in the Glitchless category, was actually able to successfully perform the trick and leap over the gate. But that success has other runners in the Glitchless category unsure about the future of the category. While the trick doesn’t use any unintended game mechanics, the result changes the run so drastically that many runners are concerned that it’s just as dramatic as a glitch. The question of what makes something a glitch is tied to the history of the category itself. Glitchless is an offshoot of a Japanese category called “Bug Limit” which banned many tricks and focused on fast movement. While Glitchless and Bug Limit are closely related, their rules differ slightly and proponents of a new Glitchless category point back to the Japanese distinction for glitches as a reason. Among those pushing for two categories in the second place Glitchless record holder, a Swedish runner named Makai. Even minor mistakes can lead to slower runs in the Glitchless category, as there are not as many chances to use glitches to skip major portions of the game. The Gate Skip is incredibly difficult to perform, requiring many “frame perfect” inputs that are easy to miss. In theory, the Gate Skip provides a choke point in the run, a moment where progress is predicated on the ability to perform a highly complex trick. Damage boosting, such as launching Link further with a bomb, is not strictly a glitch but the complex nature of gate skip and the required damage boost has some runners looking to cut boosting from their runs completely. These concerns sparked a wider discussion that lead to the reassessing of many glitches and their definitions. For instance, community leaders recently disseminated a memo outlining changes including what it means to be “out of bounds.” In the case of runners looking to focus on movement, it is defined as “anywhere Link was never intended to be at any point in the game,” while those that favor large skips define it as “areas beyond the normal confines of the map.” It is the difference between being in a place the developers never planned or completely breaking through the game’s geometry. While the community still needs to vote on the future of Glitchless runs, the Gate Skip provides a change chance to discuss the nature of glitches and explore Ocarina of Time’s game design.